The Perfect Retro Gift for the Goalie in Your Life! 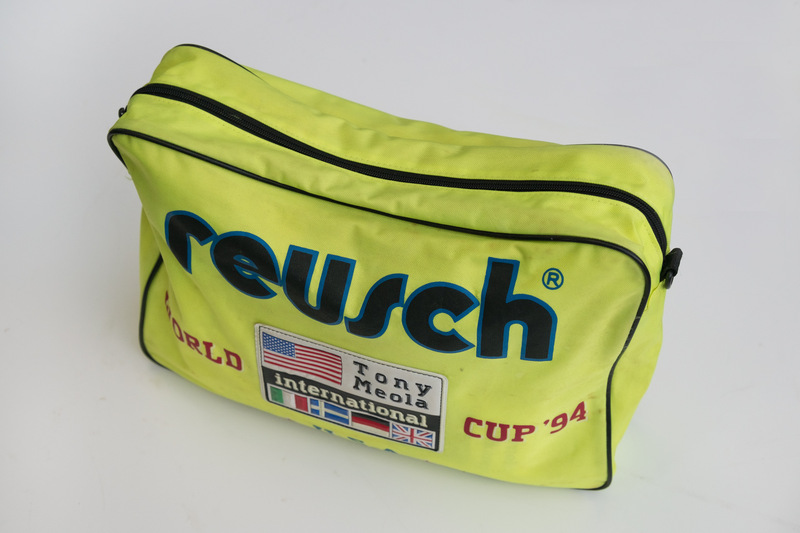 The 90s saw the disappearance of many goalkeeping staples that would be sorely missed in the future, as well as the introduction of a strange new league structure, hot tech and bright luminous colours that seemed controversial at the time, but which now also bring on pangs of bittersweet nostalgia. 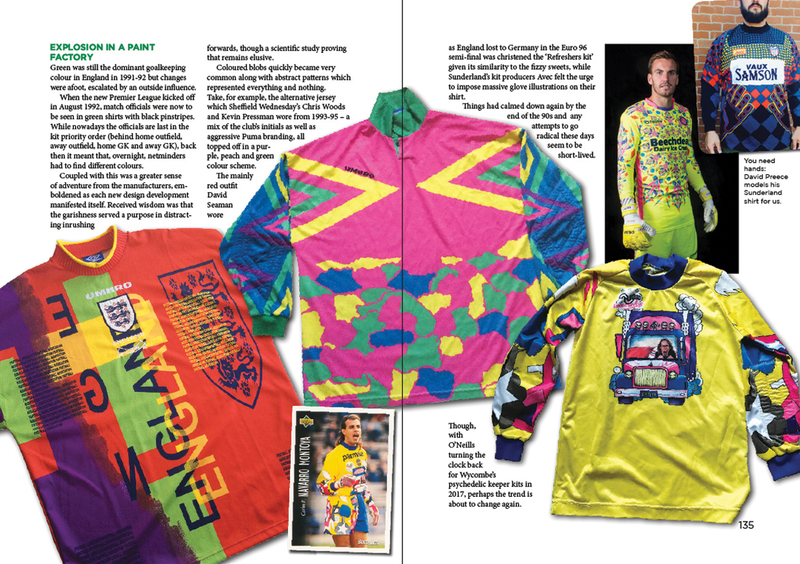 Goodness knows what happened inside the minds of goalkeepers’ shirt designers in the 90s, but after years of relatively sombre greens and handsome yellows they discovered puce and yellow and dayglo orange – often on the same shirt, in big headache-inducing swirls. Here’s a spread from Glove Story that’s enough to make you suspect the trend was something to do with the Happy Mondays, or possibly even Trainspotting. It came as a real shock when the humble glovebag disappeared from their place by the side netting, just behind the goalpost. Where else was a keeper expected to keep his spare Adidas Fingersaves, his Uhlsports with the Spiderman-like Adhesive Power Grip, his Reusch Peter Schmeichels? Never mind his chewing gum, his lucky charms, his bottle of water, his surgical gloves for wearing under normal gloves in really wet weather, his snapshot of his girlfriend and his lucky Pat Jennings eraser from his schooldays pencil case. Bring them back! 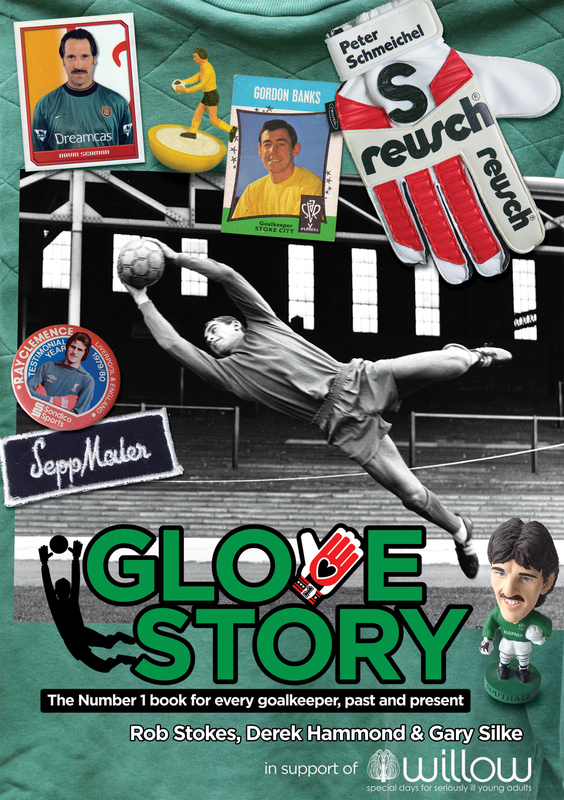 Having introduced the continental-style goalkeeper glove to the UK market in the 1970s, bringing an end to the era of cotton gloves, woolly gloves, gardening gloves and no gloves at all, mail-order genius Dave Holmes and top keeper Phil Parkes (of QPR, West Ham and England) enjoyed two decades of inspirational, cutting-edge retail action. 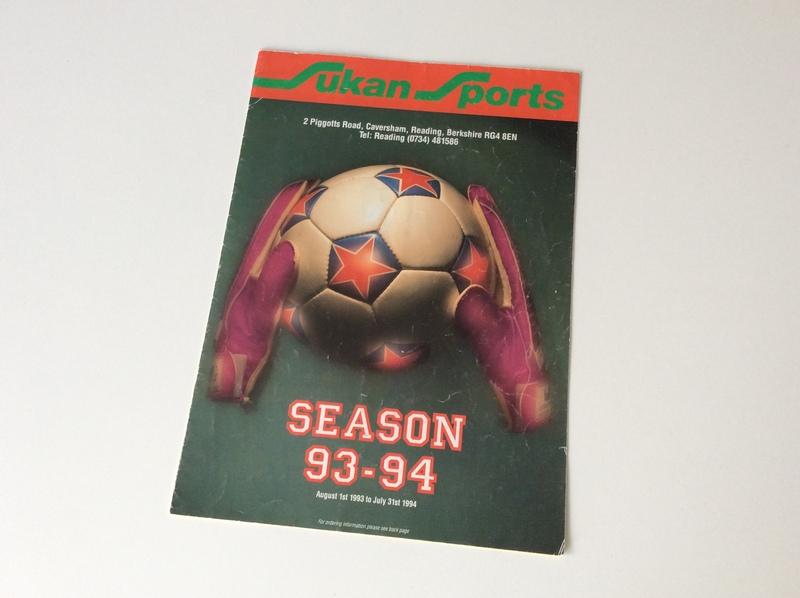 No goalie worthy of the name ever missed a birthday or Christmas without a parcel from Sukan at the top of their prezzie list. But times changed, and the groundbreaking mitt emporium finally closed its doors for the last time in 1995. Here’s two landmark games that helped to bridge the gap between the classic old-school games of the previous 20 or 30 years and the hi-tech electronic age. Just as Subbuteo and Striker table football had taken over from more staid card and board games, so the first primitive handheld and console football games appeared in the 70s and 80s, gradually taking ever more market share. 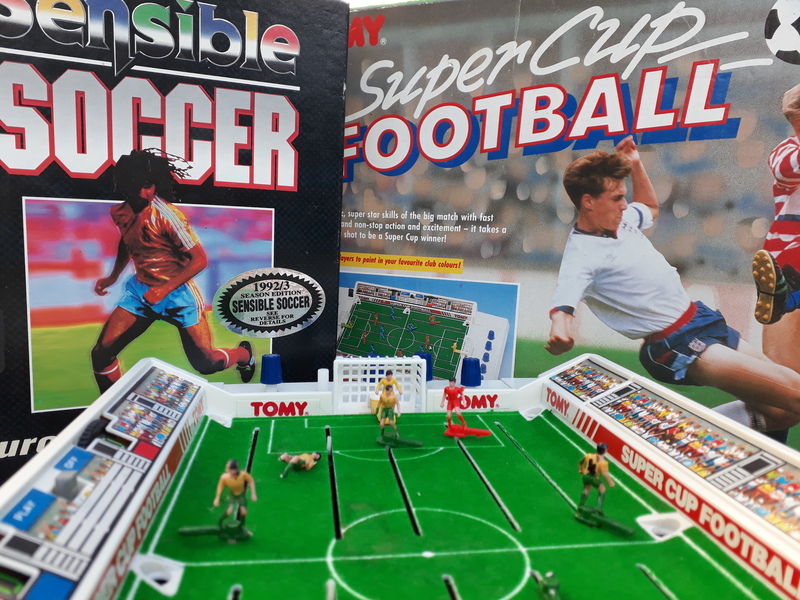 Who remembers the noisy battery-operated Tomy Super Cup Football with its goalie on a pivoting stick and air-blowing ball retrievers? Who had Atari Sensible Soccer? 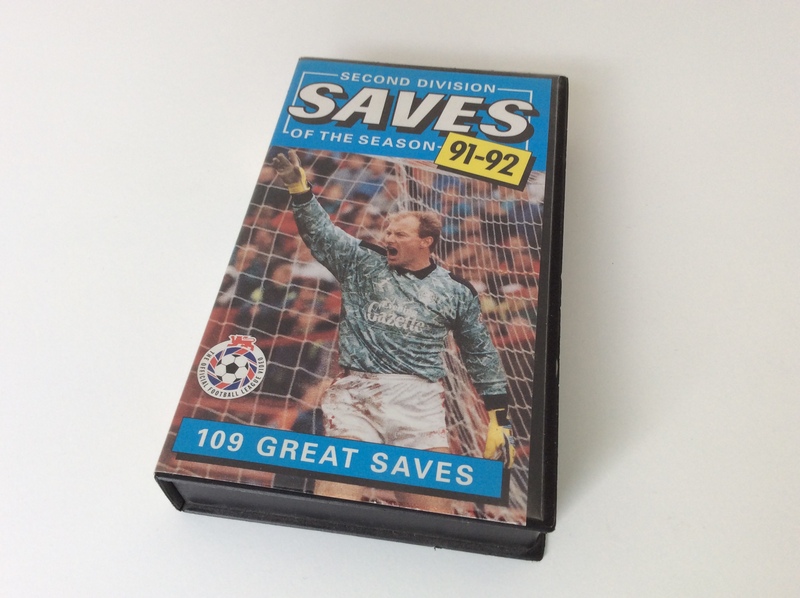 And who’s now hoping for floppy discs this Christmas, promising ‘all the atmosphere of European soccer at its highest level’ – and those irresistible-sounding ‘enhanced goalkeepers’? 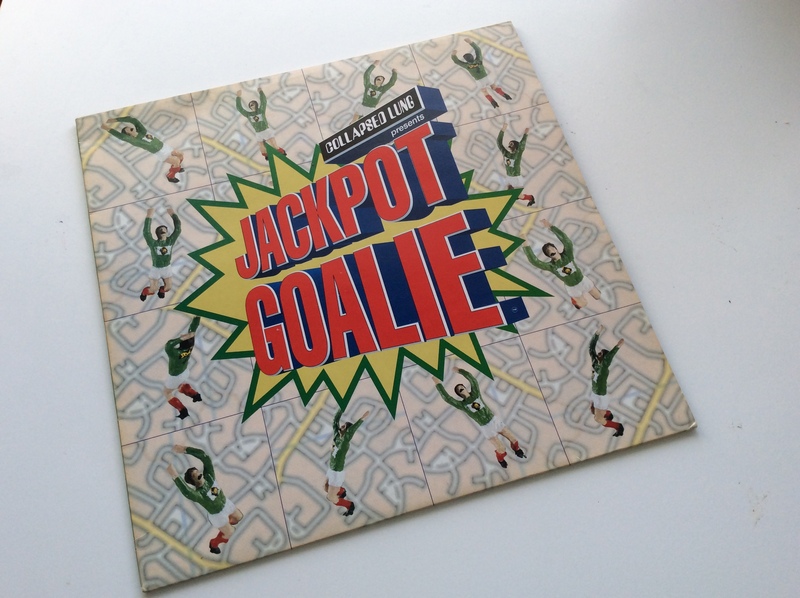 Featuring the beat anthem ‘Eat My Goal’ which featured in the Coca-Cola campaign for “Eat Football, Sleep Football, Drink Coca Cola.” Never mind ‘Three Lions’, Baddiel or Skinner – Collapsed Lung was the true sound of mid-90s footy Britpop. Give it a spin on YouTube and soak up that now-elusive goalkeeper-related baggie vibe. 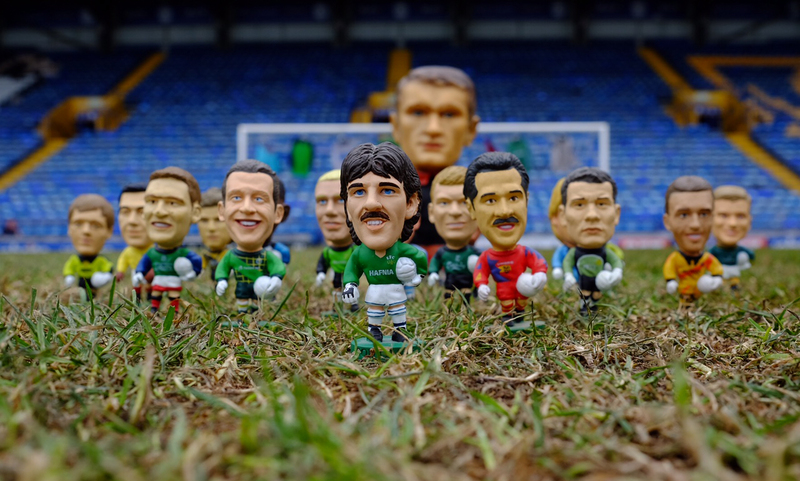 Any keen collector will know that the first Corinthian custodian was a yellow-shirted David Seaman in the ‘Headliner’ set of 16 bulbous-bonced England stars in 1995. But were you aware that the 1996 FAPL Collection missed out models for Tony Coton (Man City), Dave Beasant (Southampton) and Alan Miller (Middlesbrough), despite including them in the promotional book? We asked Alan Miller about the oversight: no goalie for Boro! “This is something that keeps me awake most nights!” he revealed exclusively. Having started out with Workington in 1969 and tumbled and handstanded his way through the next two decades, the great John Burridge finally called time on his professional career some 28 years and 768 games later, at Blyth Spartans. Here he is playing for Newcastle in 1990 – can that really be 28 years ago? Here’s wishing you all just a fraction of Budgie’s eternal, irrepressible bounce for your next birthday/Father’s Day/Valentine’s Day/Chrimbo.